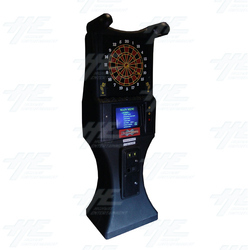 Arachnid Galaxy 11 is a Coin Operated Soft Tip electronic dart game with 15 inch colour monitor, customized winner screen, impact resistant cabinet, modem 'call out' feature, down loadable league standings/player stats. 240 volt. Comes with 3 darts, 6 tips and manual.